7 year/s ago 1386 Visit WebsitePublishing & PrintingBroken link? 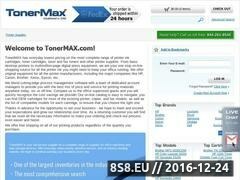 TonerMAX.com serves end-user customers in the United States with office imaging supplies and data storage products. Our website sales are backed up by a team of dedicated account management teams who provide 'above and beyond' service to key accounts. Once we earn your business, we aim to keep it, and are constantly improving our value proposition. Wide selection of imaging supplies: toner, ink, drum, developer, ribbon for copiers, fax machines, printers. Brother, Canon, Dell, Epson, HP, Konica Minolta, Kyocera Minta, Lexmark, Okidata, Xerox, etc. Hampaiden Valkaisu Teeth whitening at home. Shopping in the many teeth whitening systems and products is available at Beconfident.